I’m back from our cruise and finally caught up enough to have the time to post about it. It’s crazy the amount of time you need to catch up after a vacation! The cruise was really awesome, I would do another one any day. It was our first cruise and I’m really glad we picked a Disney cruise as it was perfect for us and very well organized like anything done by Disney. We flew down to Orlando on the Friday and the next morning had breakfast with Alyson and Travis. It was great seeing them after about 2 years. Make sure to go over to Alyson’s blog and congratulate her on her big news! We later took the bus to the Disney Magic and started a most wonderful cruise. We ate incredibly well, like eating at a 5 star restaurant every night. There were shows every night as well and activities during the day. I got to knit quite a bit on the decks or in the cafe. 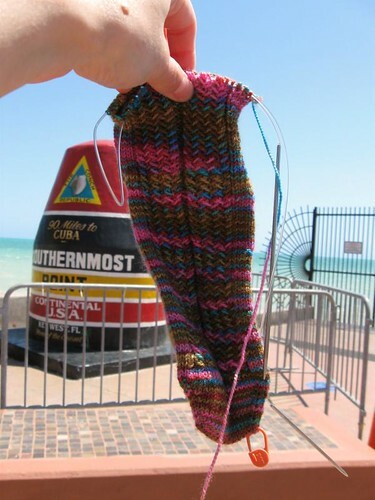 I even brought the sock in progress on some of our excursions. We went to Key West (I loved Key West! 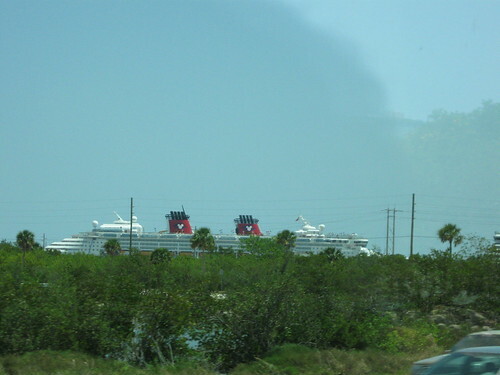 ), Grand Cayman, Nassau and Castaway Key (Disney-owned island). A Disney cruise is great for people with kids but it’s also great for a childless couple like DH and I. There’s an adult only pool on the ship, as well as adult cafe and an adult only restaurant. At Castaway Key there’s even one whole beach for adults only. I know I’m repeating myself, but I’ve never eaten so well in my life! It’s a surprise I didn’t gain the 5 to 10 expected pounds! 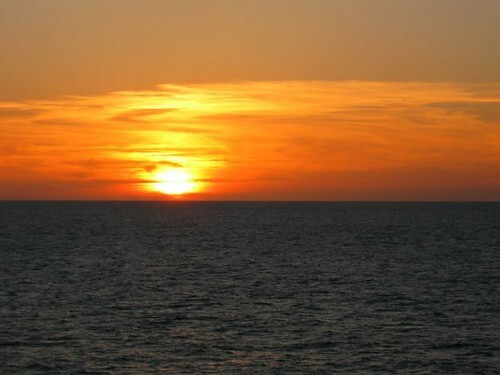 I’m already looking forward to our next cruise! If you want to see more pictures, there’s more right here! I was just looking at that sock pattern last night! It looks great with that yarn. And that sunset is gorgeous! Sounds about just right! Aren’t the people that work on the ship fantastic?